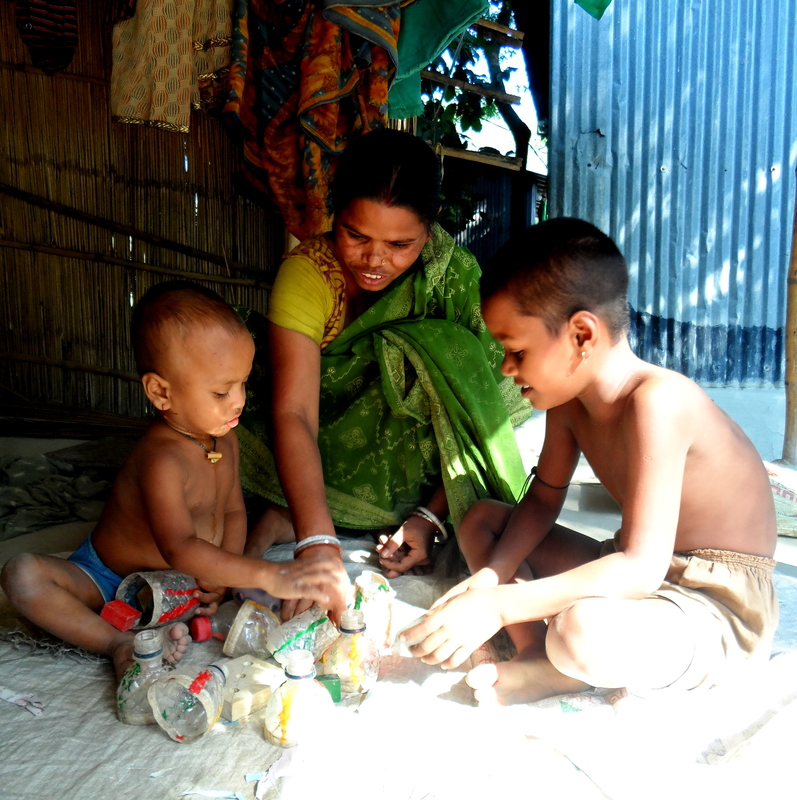 Almost 60% of kids in Bangladesh are at risk of poor development due to low body weight, and under nutrition, poverty, and sub-optimal stimulation due to low parenting knowledge.1 The mother is usually the key childcare provider and her physical and mental health is a major predictor of child development, particularly in low and middle-income countries. Depression in particular is reported as a leading cause of disease burden for women and maternal mental health is identified as one of the major predictors of child development. The goal of the innovation is to improve care-giving practices of depressed mothers, and to reduce maternal depression, which subsequently will improve children’s health and development. This project employs a two-pronged approach to maternal mental health of women living in Bangladesh. First, it uses Cognitive Behavioral Therapy (CBT) to manage mothers’ depression. Second, it trains depressed mothers on psychological stimulation (PS) to encourage them, despite their poor mental health, to care for their children. A combined program targeting both the mother and child can improve maternal mental health while additionally helping to ensure a nurturing environment for young children. ​This innovation is funded by Grand Challenges Canada. Though early stimulation interventions in Bangladesh have shown moderate improvements to child development, there are still some gaps in the pathway to delivery. One of these gaps is likely maternal depression as Bangladeshi mothers with subclinical depressive symptoms often do not seek treatment due to stigma. Due to this, depressed mothers often fail to provide sufficient stimulation and care for their children and in turn compromise benefits of existing early stimulation programs. As mothers are usually the key providers of childcare, it is imperative to invest in maternal depression programs, which in turn can encourage higher adherence to early stimulation programs. Rahman and colleagues tested an innovative model – The Thinking Healthy Programme – of community-based depression management using Cognitive Behavioral Therapy (CBT) in Pakistan and reported improvement in maternal depression 6 months postpartum.2 This innovation combines The Thinking Healthy Programme with an evidenced-based ECD program on psychological stimulation to achieve maximum benefits on reducing maternal depressive symptoms and also improving children’s overall development. In the team’s previous ECD work, it was found that minimum fortnightly contacts of stimulation workers are required to bring desired developmental benefit of children. This has been incorporated into this project by providing a combined intervention with fortnightly visits for up to one year by involving government health workers through home visits. Findings of this program will contribute to develop a model that can be implemented in other districts, cities, and countries. The program will be evaluated through a randomized controlled trial. Outcome scores of 300 mother-child dyads (150 each in intervention and control arms) will be compared. Of the 115 mothers and children who will have access to the intervention and training, it is expected that children will have 0.4 SD higher scores compared to children in the control group in two or more of the following measures: cognitive, motor, language and behavior scores. It is also expected that providers will have increase knowledge on managing and supporting maternal depression. Rahman A et al. (2008) The neglected ‘m’ in MCH programmes–why mental health of mothers is important for child nutrition. Tropical Medicine International Health 13: 579-83.